Tripp Lite 6in Mini DisplayPort to VGA Adapter Active Converter mDP to VGA M/F DPort 1.2 6"
Tripp Lite's P137-06N-VGA-V2 Mini-DisplayPort v1.2 to VGA Active Adapter Converter allows you to connect a computer with a Mini-DisplayPort or Thunderbolt™ connection to a VGA monitor. 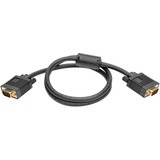 Ideal for Thunderbolt™ /Mini DisplayPort equipped laptops, Chromebooks, MacBooks and Microsoft Surface. Mac 10.11, Windows 10 Compatible. DisplayPort v1.2 doubles the previous version bandwidth of 8.64 Gbps to 17.28 Gbps in High Bit Rate (HBR2) mode, which allows increased resolutions, higher refresh rates, and greater color depth. Supports VGA computer video resolutions up to 1920 x 1200 and HD resolutions up to 1080p. 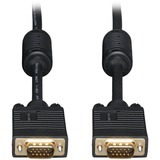 Unlike passive adapters, Active adapters convert both Single-Mode and Dual Mode (DP++) DisplayPort output. 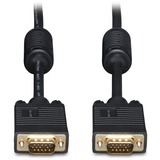 It is ideal for use with graphics cards, such as AMD Eyefinity, that do not output Dual Mode (DP++) signals.